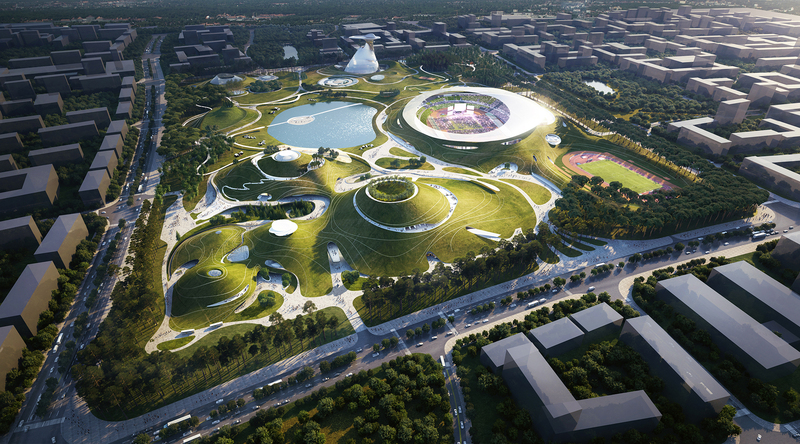 The “Quzhou Sports Campus” designed by MAD Architects, led by Ma Yansong, has just broken ground in the historic city of Quzhou, in China’s eastern coastal province of Zhejiang. 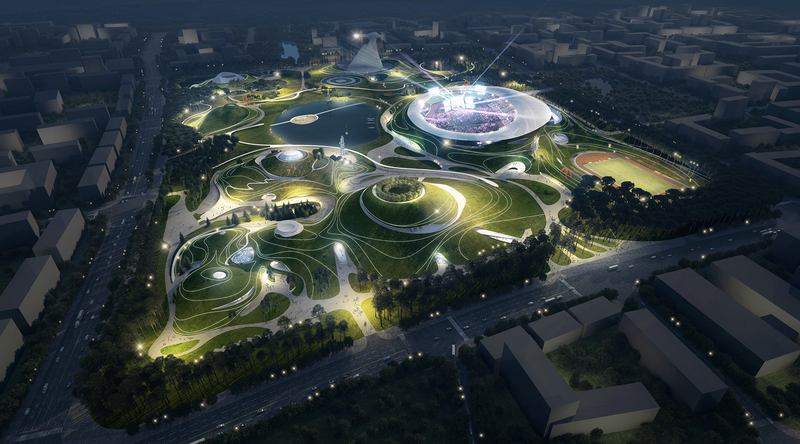 Spanning almost 700,000 square meters, the first and second phase have a total construction area of approximately 340,000 square meters, and include a stadium (30,000 seats), gymnasium (10,000 seats), natatorium (2,000 seats), national sports complex, outdoor sports venue, science & technology museum, hotel accommodations, youth centre and retail programs. 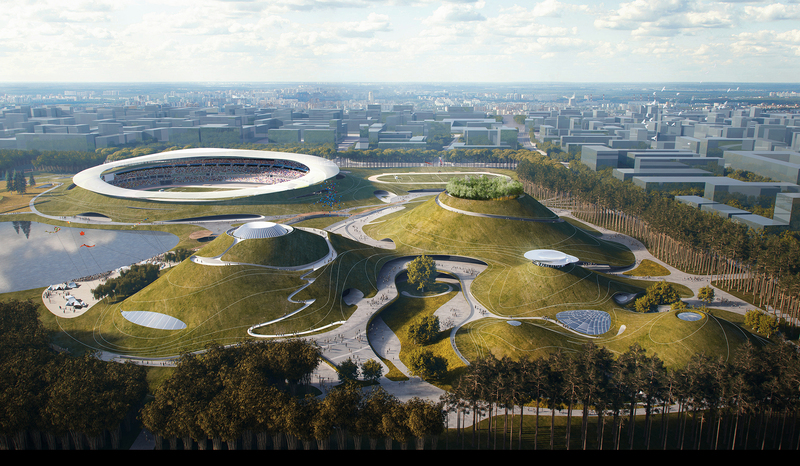 MAD’s design embeds the functions of the sports park within natural forms, creating an earth-art landscape in the center of the city – a poetic landscape that falls somewhere between that of Earth and Mars. 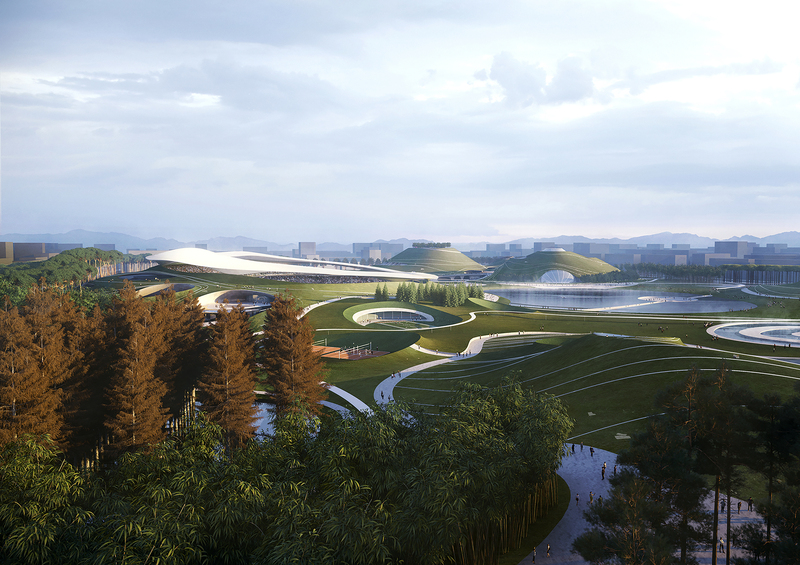 "We dream not only of creating an urban space about sports and ecology, but also turning it into a unique land art park for the world, establishing a relationship between the city’s heritage and history of Shanshui culture," says Ma Yansong. Quzhou is a city with thousands of years of history, containing deep traditional culture and philosophical ideas; complemented by beautiful scenery, with lush forestland covering more than 70% of the land. It is the region’s profound historical culture and natural landscapes that are its most precious resources. With this in mind, MAD envisions a surreal, ethereal and tranquil artistic landscape in this modern city, like a mirage, that has the potential to become a place of spiritual belonging for the future of the city. The perimeter of the site is surrounded by a dense forest of high-standing trees that secludes the uninhabited land from the city. As one enters, the view suddenly opens up towards broad horizons and the bright sky, while simultaneously appearing as a martian landscape, mysterious and illusory. The overall environment stretches in large expanses and undulates; and the terrain of the mountains exists in a way that is sometimes open, sometimes huddled, and sometimes overlapping. As people move through the park, they drift, climb, and traverse the terrain. In the middle of park, there is a lake that has also been conceived as a sunken garden. Here, one’s line of sight looks straight out across the stillness of the water, offering the experience of an untouchable spiritual atmosphere as it reflects the mountains and the sky. 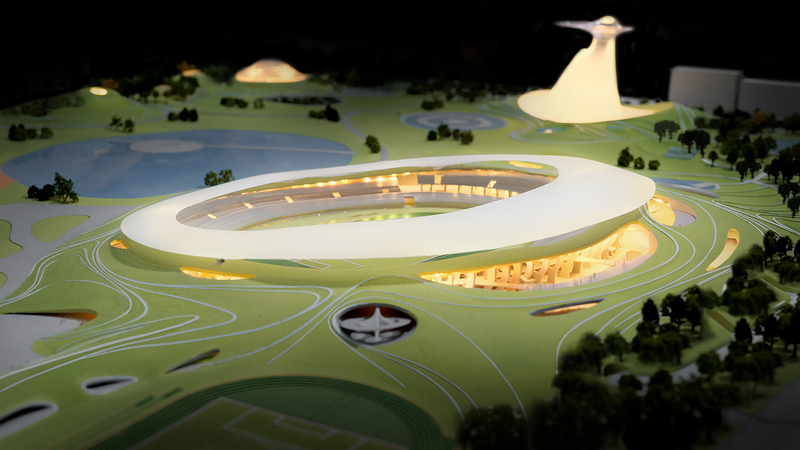 Resembling a crater, the stadium sits into the ground, forming a deep space. 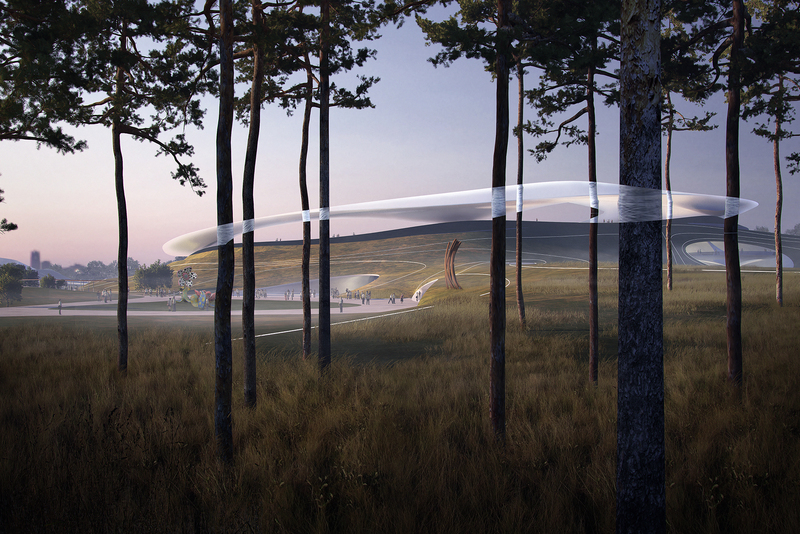 It is crowned by a translucent “halo” that gently hovers above the ground like a floating cloud. Its proximity to the earth makes it seem within reach – close but untouchable – inviting people to engage in a dialogue between the earth and the sky, and discover spiritual truth. The adjacent rolling “hills” on the northeast side form the gymnasium, natatorium, and training centre. Above are public spaces and natural scenery that attract people to look up and pause in a moment of contemplation. The buildings in the park breakaway from that of traditional stadiums and athletic complexes that typically highlight structural power, transformed by a more intrinsic and subtle beauty. 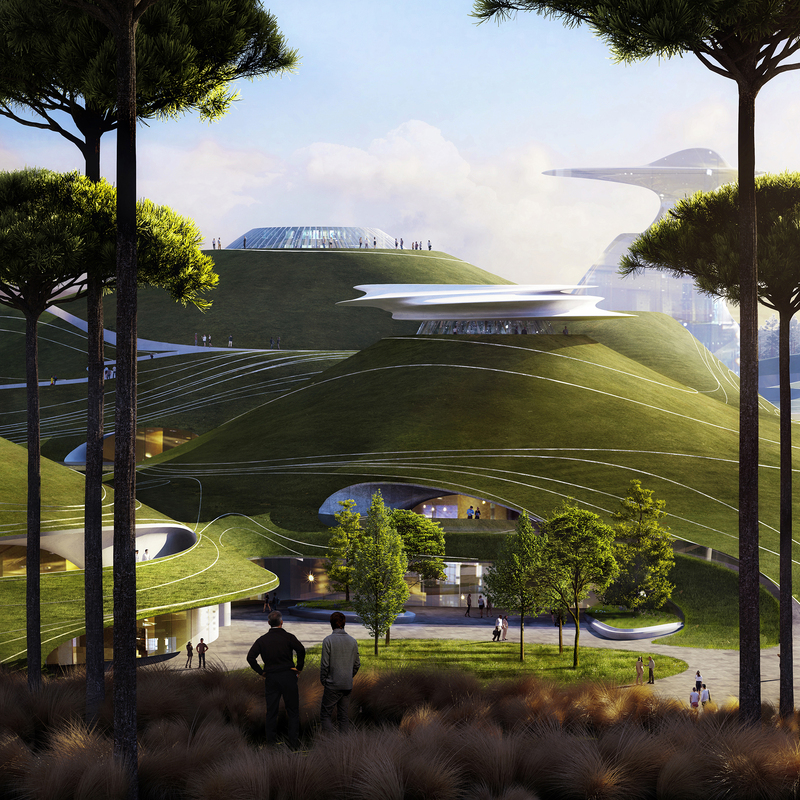 The interiors and exteriors of the buildings are connected to nature, providing an openness towards the landscape for people from anywhere, so that they always feel like they are immersed in nature. Pathways between the mountains and the lake meander over and through the architecture. They encourage people to slowly walk around the park, run along the trails, or just enjoy a seat on the lawn to take in the scenery. 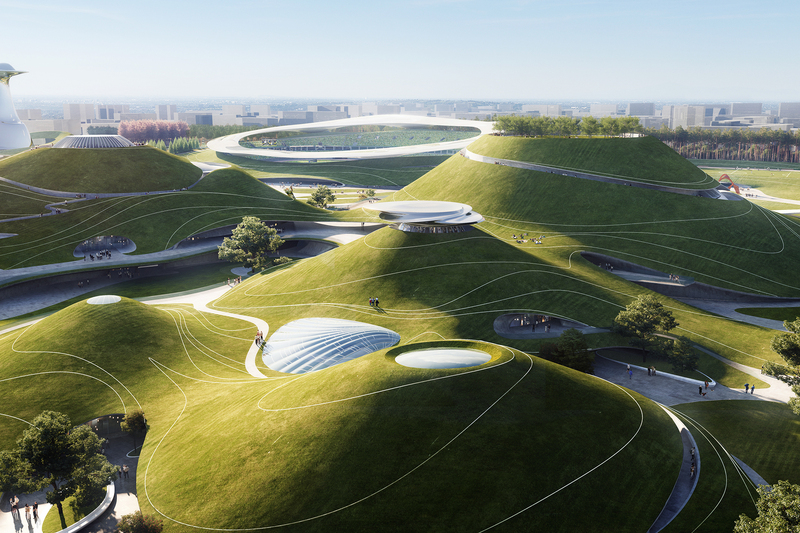 The “peaks” and “mountainsides” of several of the “hills” are designed with platforms or skylights that allow natural light to flood onto the interior, and provide natural ventilation through the buildings. 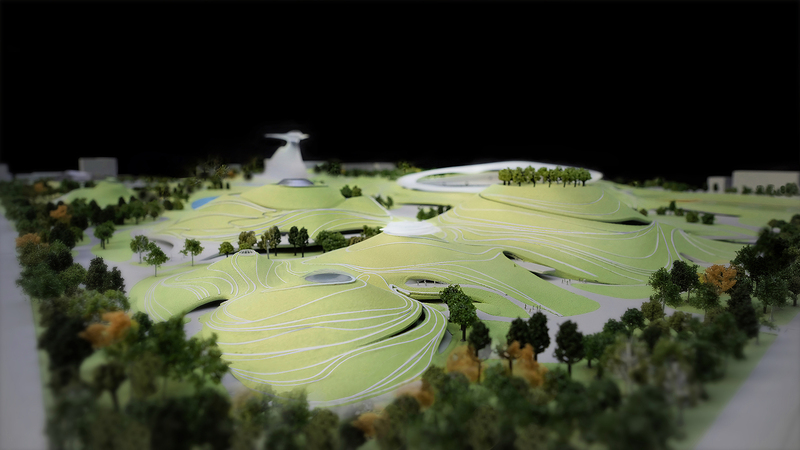 The exteriors are covered in greenery, which while being energy-saving, are also human-scale and accessible. They invite people to climb the “mountain”, walk along the “mountain” trails, and form a closer physical and emotional connection with heaven and earth. 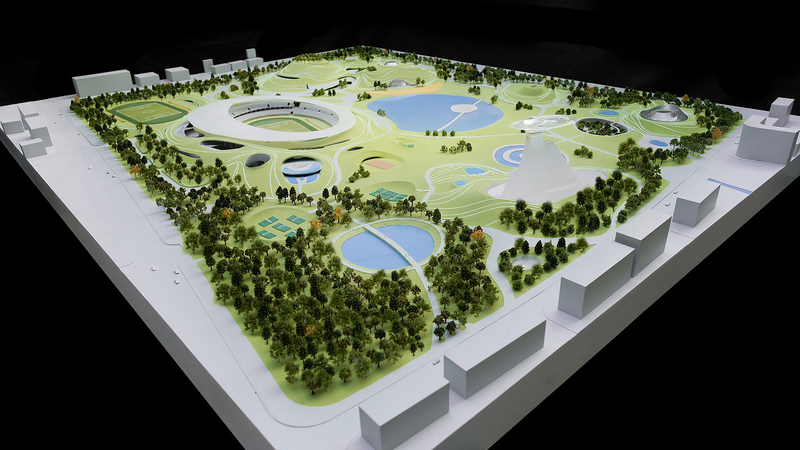 “Quzhou Sports Campus” abandons the traditional urban construction model of conventional large square landmarks. 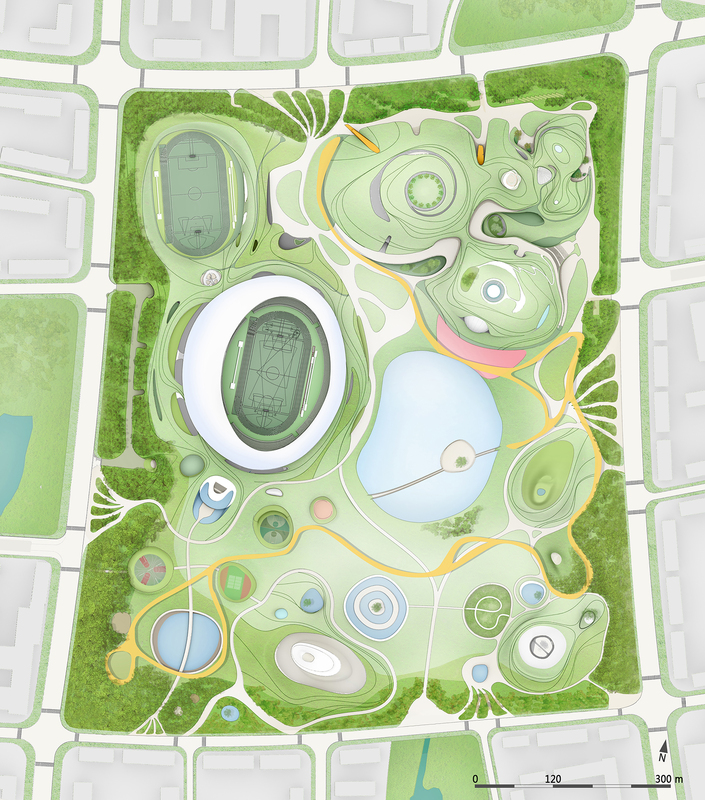 Drawing on land art and the natural landscape, it forms a unique urban space, one that is embedded in the spiritual understanding of the people, nature, and culture of the city. In the early stages of humankind entering modern civilization, the Olympics put forward the slogan: “faster, higher, stronger”. This coincides with our challenges of conquering nature in the rapid development of our modern cities over the past century. As we move forward, the future of urban development has the potential to change and open up in new directions – towards a future where we pursue the harmonious relationship between man and nature. Ma Yansong said: "The relationship between man and nature is not only about ecology and sustainability, but it is also about spirit and mood. This is the culture and philosophy that has long existed in the history of this land and needs to be applied in the development of our future cities."